The purpose of this utility is to recalculate an item's first and last received date. The application will prompt for an item first received cut-off date. For any item with a first received date on or after this date, the application will re-calculate its corresponding first received date and last received date by reading through the Inventory Transaction Audit Trail file (IMINVTRX). This utility is necessary because on 3/11/16 a feature was introduced into Elliot that enabled the system to update the Item First Received and Item Last Received fields whenever a BOMP work order is produced. This is in addition to the PO side update. Companies that both purchase and produce the same item may want to continue to update these fields from the Purchase Order module only. The default value is “N.” Companies that only want to update this field from the Purchase Order module should set this flag to Y. Companies that ran with the option not set to Y may want to reset the first and last received dates to reflect the activity from the Purchase Order module. This utility program will reset the dates. However, this utility SHOULD NOT BE RUN UNLESS YOU HAVE BEEN DIRECTED TO RUN IT BY NETCELLENT'S SUPPORT PERSONNEL. This new utility is available from Global Setup -> Utilities -> Generate Statistic Info -> Recalc Item Date 1st and Lst Recv. Starting/Ending Item - User can use F7/F8 to search for item number. If user presses Enter, all items will be processed. Item 1st Received Date > - User must enter a valid date in “Item 1st Received Date >” and cannot just hit Enter for “All.” Users will need to need to know the true first and last received dates based on PO, not BOMP. This utility will look at the Global Setup flag “12. Update Item Date 1st/Last Recv from PO Recv Only?” and decide whether to look at PO Receiving Trx only, or include the BOMP production transaction as well. The utility will produce a report listing the items that were updated, the original dates that were on file, and the new dates the item was updated with. 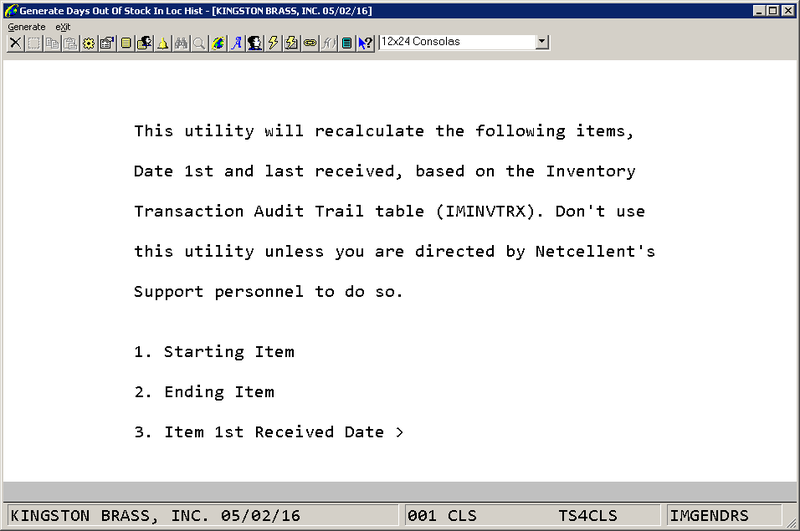 NOTE: This utility updates the first and last received dates based on the data in the Inventory Transaction Audit Trail File. If you have purged this file, the dates may be set to a later date rather than when the item was truly first received. Use caution when running this utility program and only run it if advised to do so by Netcellent's support personnel.